Pneumonia is an infection that inflames the air sacs in one or both lungs. The air sacs may fill with fluid or pus (purulent material), causing cough with phlegm or pus, fever, chills, and difficulty breathing, according to Mayo Clinic. As a loved one, it’s important to know the causes, symptoms and prevention for pneumonia just in case your family member starts to feel ill.
As a family member or loved one, it’s helpful to know the signs and symptoms of pneumonia so you can be prepared if the time ever comes. 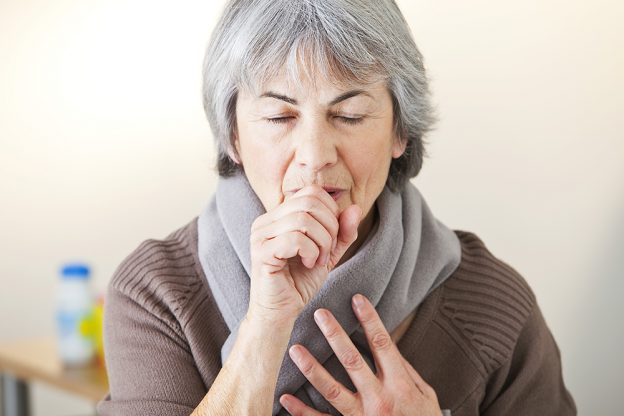 While symptoms of pneumonia can be similar to the flu, these symptoms usually last longer. Get the flu shot: The flu is the most common predecessor to pneumonia in elderly people. We recommend that seniors over the age off 65 get a flu shot each year as well as a pneumococcal vaccine that protects against pneumonia bacteria. Wash your hands: It’s important for seniors to keep their hands germ-free by washing them often. If you’re a caregiver, you should be washing them just as much, too. Exercise, rest and practice healthy eating habit: Make sure your loved ones are drinking lots of fluids and avoiding anything that might cause stress and weaken the immune system. They should eat lots of fruits and vegetables. Without proper nutrients, seniors can become malnourished and thus, have a harder time fighting off illness. Keep in mind that prevention is much better than treatment. Seniors who are hospitalized for pneumonia are at a higher risk for long-term physical and mental problems. Now that you know the causes, symptoms and prevention of pneumonia, you can be prepared if your loved one falls ill. If you think they might have pneumonia, contact their doctor right away.